This package includes This item is delivered on line. Since it isn't shipped, be sure before you order that your shipping charges are 0.two hyperbooks — "Spreadsheet Models for Managers" and "Enterprise Spreadsheet Management." The first is about using spreadsheets to model businesses and business processes, from the perspective of a manager. The second is about using spreadsheets to manage enterprise data, from the perspective of a budget manager or a proposal manager. Both are packed with tips, tools, techniques and dozens of worked problems. They will transform the way you use spreadsheets in your buisiness. 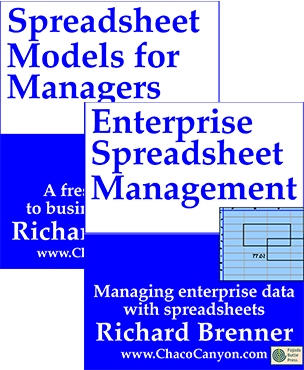 Package: Spreadsheet Models for Managers and Enterprise Spreadsheet Management, online editions has dozens of worked problems designed specifically to show you techniques for managing enterprise data using spreadsheets, specifically, Microsoft Excel. The goal always is to present examples that are simple enough to understand, that illustrate the points that are most essential to grasp, and yet to avoid the details that, while essential in "real life," can make learning difficult. When you order this package you'll get extra savings of almost 56% (USD 398.00) compared to ordering these items separately. This item is delivered on line. To avoid shipping charges, be sure to select "online" for the shipping method.